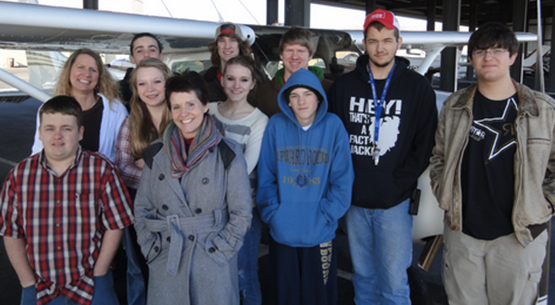 The experience I had at the Greeneville Airport trip on Thursday was Awesome! Everybody was nice including the pilot and Colonel Bill Powley and the most awesome part was when the pilot flew up then completely down creating the 0G effect. My experience at the airport was amazing. Thursday was the first time I ever flew in an airplane. My favorite fart of the flight was the 2G and the 0G. I've done a lot of things and flying with you has been the best experience I've had. It was amazing and I loved it and I can't wait to do it again. I thought that flying was going to be scary but I was surprisingly calm for most of the ride. It was something I would do again. I thought it would be scary, in my honest opinion, but I loved it. I videotaped the two g and zero g. It was one of my best experiences yet and I hope to come back too. My experience on the plane was one of the best moments in my life. I finally got to be a bird for a day; I now understand why birds fly all day and night. It was a very good experience for my life and I hope I can go again sometime. I thought it was really fun and interesting. And I love how you tuned the plane enough to let it land its self. It was the best time I have had this year. It was like flying was in my blood. I had flown before, but the last time I did I was in the back seat. This time it was more personal. I was able to fly the plane, takeoff and land. I had a very good time when I rode in the plane. When you did the zero gravity and the 2g my mind was blown. I had a fun time. Never flown before so it was a enjoyable time. It was so cool and it was amazing and it was my fifth time flying. It was my first time in a plane and I already want back in another plane. I loved to 0g part because it made my stomach feel like it was going up into my throat. This was an awesome second time around and it was quite an adrenaline rush. It was my first time flying. I had an awesome experience. I loved the 0Gs; it was crazy how one second you're twice your body weight then the next you weigh nothing, but thank you for the awesome experience. Although it was my second time in an airplane it was as amazing and as awesome as the first time that I went up in a plane. When I got in the plane I was so nervous but now I love flying. The zero gravity was the most fun part of the whole ride. I had a really enjoyable time. My favorite part was the 0g because I felt completely weightless. I also liked the dive bombing and the tactical side of flying. This is only my third time flying. It was also the 1st time I got to help fly the plane. It has inspired me to learn to fly. It was an incredible experience. I had a fantastic time flying. I have never flown before and this really taught me a lot, plus it was fun. The 0g and 2g maneuvers were my favorite parts of the flight. The flight was super. I hope I can do it again. Thank you for the flight. I had a great time today. It was cool to see the Gray area from the sky and to learn about flying. I liked the dive bombing and the military side of the flight. I want to do this again. I was really shocked at how different everything looked from the air. The experience was great. I have never flown before. It was incredible. I'm glad I had the chance to do this. The flight was really educational. The 0 gravity part was scary and the 2g lift made everything heavy. I learned a lot today. Thank you. Having a firsthand experience in the co-pilot's seat is beyond my ability to explain. Seeing our local area from the air was fantastic. I had a blast being able to help take-off and control the yoke. I can't wait for next year. Flying was a great experience. It's cool to see the world from a different perspective. My favorite part of the flight was when the pilot turned the plane to dive and there was no gravity in the cabin. I am grateful to have this experience that most students don't get a chance to have. The colonel showed us how different the area looks from the air. We chased our instructor's van, did dive bombing maneuvers, and experienced 0 g's. Our pilot was very nice and instructive. He also told us about the Air Force. I not only enjoyed the flight, but I learned a lot about flying and physics. It is much different than learning in a classroom. Also, it is much more fun. Thank you for the chance to experience flying. The flight was very interesting. The lake looked beautiful. I really enjoyed all of the experience. Not only did I get to fly, but I had a chance to control the plane on take-off and in the air. Fantastic! I hope to be able to do this again one day. Much better than being in class, plus I learned more. To be able to fly was really great. I can't wait to do it again. I hope I get the chance to sit in the co-pilot's seat. The best part was dive bombing and turning the plane off. It was my first time in a plane and first time co-pilot. It was the most amazing thing I have ever done. I want to go again!!! This was my first time flying and I was terrified, but I would love to go again. This is my favorite experience. This was my first time flying, and I absolutely loved it, I will definitely do it again. It was absolutely fabulous! It never ceases to take my breath away even though this was my third time. This is one of the highlights of my year and I would love to do it next year. For my first time flying it was one of my most awesome experiences! This was a fun flight! I have flown before and this time I got to fly the plane. This trip is my favorite field trip this year and I want to fly again soon. Thank you, Commander for bringing us to fly, and thank you, Colonel Powley for taking us for the ride in the plane. The first time I flew in a plane was freshman year, I'm now going to be a senior, every time I come on these trips it's a new experience and even more fun! Thank you Colonel for always making each flight new and better! For the first time, it was good, not as bad as I thought. I have seen in the few moments in the air more definitions of humanity then I have in my years of being alive. To my very right pure terror and to my further right animal instinct as well as myself being sort of off. It was a surreal experience I would do so again if I had the chance. This was my first time flying. I had so much fun. The first 0G drop scared me because one of the crew tried to open the door. Haha. It was the time of my life. He gave me control and the biggest smile came on to my face. It was the most fun thing I have ever done. I freaked out. It was fun for my first time. It was a fun experience, just like my first time and I can't wait to do it again! I flew the plane for the second time. It was really cool. I drove the Piper for our flight and sadly couldn't see over the dash. Other than that, I had the most fun flying and really can't wait to go again. I rode in the Piper and had a wonderful time. It's fun being up in the air. It was my first time flying in any sort of plane, so it was an exciting but also scary experience. Once the wheels left the ground it was freaky knowing you were in the air but also inside of some machine, especially when you're up front with a whole lot of buttons in front of you. Probably the best part of flying was the fact I was in the air. Seeing the town I have lived in forever look just like a scale model was amazing. The Zero G's wasn't something you see every day, and landing. . . Landing was terrifying. Cars are hard enough to understand, but with a plane you don't use a wheel so you're reliant on your feet. Despite that, that flight will definitely stand out in my memory as something I will never forget. This was my first time flying. I had a great time. The experience was great. When we went zero g's was the best part until we stopped then I felt sick. All in all this was an amazing experience. I'm Jonathan Nguyen, I'm in 9th grade and yesterday which was 3/11/14 was my very first time flying! It was an amazing experience but there were some moments where I wanted to puke and that was the part where there was almost like no gravity for a couple of seconds. Even though I didn't get to fly, I still had an amazing time at Tri-Cities Airport. I had an amazing experience that day and I would love to stop by again during the summer. Well today was my first time in a plane, much less flying one. Yes that was not the best idea in the world, but in all seriousness it was amazing. At the start of the day I was super excited and maybe a little nervous too. We were in a Cessna 172 and man that thing was a lot smaller than I anticipated it to be. Even though we were only 1500ft off of the ground everything was so tiny. Lt Colonel Powley was a great instructor and I enjoyed myself entirely. And I definitely have the flying bug and I would love to go again. Even though I almost killed "Sonny and HW," now I think I did pretty good. But I just wanted to thank everyone for this experience. Can't wait till next year. This was my first time flying and I loved it. Lieutenant Colonel Powley made it a great experience. Kendall did a great job flying while Sonny and I were in the back taking pictures and freaking out. On the way over I was scared and then when I got there it wasn't too bad. Everything was so much smaller from 1500 feet in the air. The view from Cessna 172 made everything look so flat. It was an amazing view! Thank you for this experience. Oh, and Sergeant P. and Lieutenant Colonel Powley are the best JROTC instructors ever!!!!!!!! 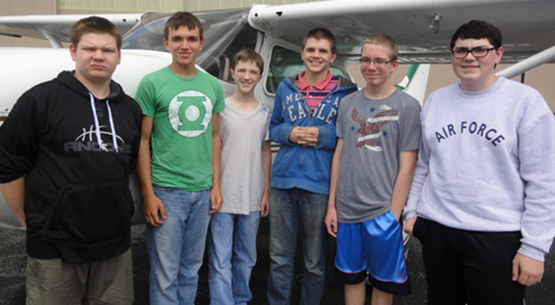 My experience with Lieutenant Colonel Powley in the Cessna 172 was really exciting and exhilarating. When he gave me the controls to take off I was really nervous because I had never piloted a plane before. This was my first time flying with AFJROTC and I got to sit in the front seat! Sergeant and Colonel are the best ROTC instructors ever! I thought feeling like an astronaut was amazing. Lieutenant Colonel Powley made some great observations while we were in the air. I can't believe he has been doing this 22 years! I really enjoyed my first flying experience and I am ready for the next time we go! Today was my first flight, as well as the most exciting and terrifying experience of my life. Lieutenant Colonel Powley took us (Mindy, Hannah and me) on a grand tour of Kingsport and I do not think I will ever look at the city the same way again. The view from the Cessna 172 airplane was so much more amazing than I could have imagined. Today's memories that I shared with Mindy Kendall and Hannah Whitehead are not ones that will soon be forgotten. Lieutenant Colonel Powley is the best pilot we could have hoped to for. Oh, and let's not forget to mention that Sergeant "P" and Colonel Vogt are the "most awesomest" ROTC instructors ever! I enjoyed flying with Colonel Powley. This was my first time flying. I learned a lot about flying especially being the co-pilot I got to help out with flying. I really loved the dive bomb, it was an amazing feeling. This was my third time flying. It gets better every time. We went 2gs and 0gs and did a dive bomb. It is a little scary to go high in the air, because I have a fear of heights. I would love to go fly again with Lt. Col Powley. Today was the second time that I've ever flown, and it was better than the first. I was a little scared at first, but it was tons of fun. The view was great from the air, and I could see all of Kingsport too. I think that, in the future, I would like to learn to fly. It's amazing. Flying was an outstanding experience. I want to be a pilot when I get older so getting to fly the plane and seeing how it worker really made me more interested. The parts I enjoyed the most was getting to see Kingsport from the sky and getting to do the zero g drop and the dive bombing. I hope to get to fly again and get to get my solo flight badge. Well I thought it was pretty neat and this was my first time flying in a plane. So I did like it when we did zero G. It made me not as afraid of heights as I use to be. If we do it again I will go again.I got some neat picture of DB and other places, even South. So I hope next semester we do it again so I can even fly the plane. This has just now been my 2nd flight in the clouds, though I took the role of passenger instead of co-pilot, not that I regret it. I enjoyed seeing things as a passenger, for I could see the seemingly tall mountains of Tennessee turn into the smallest bumps on the ground, and they were majestic to say the least. To see the world from a bird's eye view is simply fantastic and jaw-dropping, quite literally. As my head adjusts to ground level again, I can recall how the water sparkled in the lakes and rivers, all the way up in the clouds. The scenery was both inspirational and breathtaking. The rush and thrill of sharp turns, nose dives, and just flat out gazing at the seemingly endless horizon covered in mountains and trees makes me want to go up again, as I hope to next year. Also, Lt. Col. Powley, Col. Vogt, and SMS Pellitteri are the best in the whole wide world!!! Flying was an interesting experience based on the fact I have yet to co-pilot the plane. The first time I had gone I sat in the back seat and didn't truly experience the flying firsthand only as a bystander. Flying the plane was an exquisite and unique experience. On the contrary Sergeant Pellitteri and Colonel Vogt are the best instructors ever. Sorry Lieutenant Colonel Powley. My experience with flying was very crazy and scary. Villars was a very good pilot. Dingus and I were in the backseat. We saw Sullivan South High School, Rock Springs Elementary, Ross N. Robinson Middle School, Andrew Johnson Elementary, and Dobyns-Bennett High School from the sky. It was an awesome flight even though when you get out of 0g your arms and legs are stiff to the point where you can't move them. It was crazy when we landed because there were a lot of instructions that Colonel Powley had to tell Villars. After all I had a really great time with everyone. I would love to go flying next year. Colonel Powley is the best pilot ever!!!!!!!! SMSgt Pellitteri and Colonel Vogt are the best AFJROTC INSTRUCTORS EVER!!!!!!!!!! My experience was fun and scary because of Villars flying. Villars is a great pilot. I trust him to fly a plane. Holt was freak-out even when we got off the plane. Col. Powley was fun to fly with and it was an honor to fly with him. 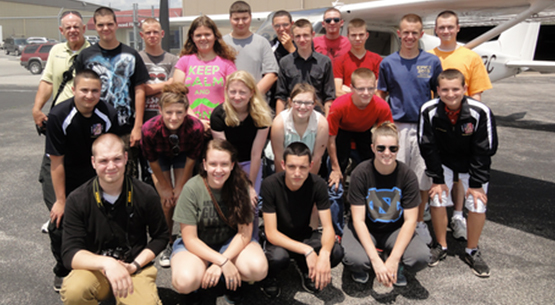 I hope everyone who went flying had a great time and had fun with Col. Powley. Thanks Col. And Sgt. for letting us fly with Col. Powley. It was weird when Col. Powley went up and down and to side and to side. We got to see DB and Eastman from the sky and look bigger. This will be me second time riding in a plan. The first time was when the school went to California. The zero gravity was fun. I had an awesome time flying in the plane. I'm in the 12th grade. This makes the 3nd time I have flow with you and it make the second time I been in the front. I like the zero gs and the dive bomb and going over the school. The experience made me rethink my career choice, maybe. The zero g was the best. I would do it again in a heartbeat. I was truly an outstanding experience. Thank you very much Colonel. It was amazing. I wish I can do it again. I wish next time I can fly it. I loved it. Colonel Powely, I would like to thank you for letting us fly again. My second time flying was ten times better than the first. The first time I flew I was a little nervous and did not know what to expect. But this time I was calmer and could enjoy the flying and all the crazy tricks. Sadly this was my last time flying with you but I will never forget this experience. 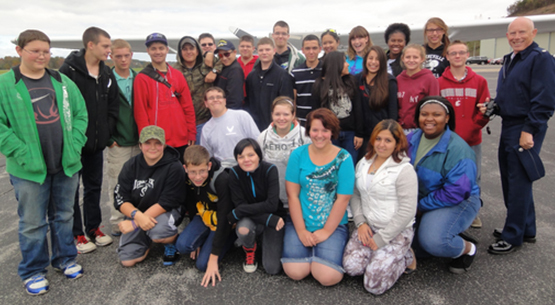 I had the best time going flying with the JROTC. It was something that I never experienced before. I didn't fly the plane, but I still had a great time inside the plane. When the pilot went straight down I felt like I was weightless. Over all getting to fly in the plane was a speechless experience of my freshman year at Dobyns Bennett High School. Thank you so much for providing funds and resources for us to be able to fly and learn. It was an amazing experience to ride in the plane and to learn about flight through firsthand experience. It was a great opportunity, and the view was amazing. I felt safe, and it made me want to be a pilot. Best wishes. I would like to thank you for the free flight that you provided for my class. It was a true privilege to get to be part of such a great program. At first I didn't really like aviation; I just wanted an easy A. But now after this flight it has encouraged me to become a pilot. I hope to go towards my license as soon as possible. Once again I thank you and I hope you have a wonderful Christmas. Thank you for letting our class fly. I enjoyed coming out and flying this morning. It was my first experience flying and I was really nervous the whole time waiting in the lobby. Thank you for providing the opportunity to let me fly for the first time. Once we got into the plane and we started to lift off I lost all my nerves and I realized it wasn't as bad as I thought it would be. I've always been scared to fly but I've also always wanted to be able to have the opportunity and thank you again for providing that for me. I hope to come back and fly again someday. Whether it be with a class again or by myself I'll have just as much fun as I did today. Thank you again for letting this happen. Lt. Col. Powley I thank you for providing the resources to letting us fly this morning on 11/25/14. I had an awesome time. That was my first time in a plane. I'm glad I did this because I'm now planning on being a pilot of a black hawk helicopter. Thank you for letting us go to the airport and fly. It was fun. I liked it a lot. We appreciate that you gave us money to fly to gain some experience. Thank you for letting us fly today with the pilots. It was a very fun experience and it made me consider aviation a whole lot more. I have flown before but not in an aircraft that small. Thanks for the resources to be able to fly the aircraft. I really enjoyed it and really want to consider flying as my career. I am extremely grateful for the thing you did for me and my friends today. It was really fun and they thought it was fun to. The thing you did for us is great. Thank you and God bless! Thank you for giving our school the opportunity to have a free flight. 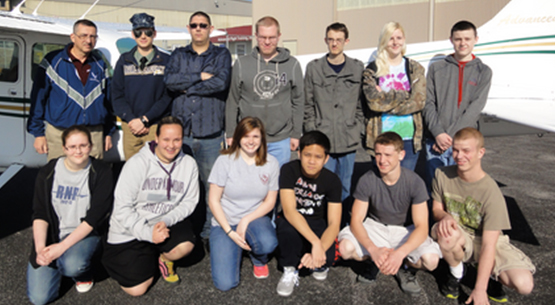 It was a great experience for everyone and it really sparked my interest in an aviation career. The flight was very fun and the view was beautiful. Thank you for giving me this opportunity. I am really interested in learning how to fly and it was cool seeing how a smaller aircraft felt. It was interesting how smooth the plane felt when it took off, turned, and landed. It was exciting to be in the passenger seat and see everything from the front view and hear the communications. Thank you for giving me this once in a lifetime opportunity. Thank you so much for making the resources to provide knowledge of flight available to us. I appreciate it very much. I wish that there were more people like you in this world. You have provided me the firsthand account of how an airplane takes off, does the flight route, and lands. It was an amazing experience. I hope to be able to experience it again. Thank you yet again for the ride in an airplane that would not have been available if it wasn't for you and your foundation. Thank you for letting me fly. I have never flown in a plane before! It was really nice for me to finally get into a plane. And it was really fun! I loved it and would love to do it again! And it would be even more fun to fly the plane! Thank you for giving us the opportunity to fly. You have opened a door to many people that do not have the resources to do something like this. This has inspired me to reach even higher in my education in aviation. It has reinvigorated my passion for aircraft and flying them. I am extremely grateful for what you have done for me and my friends today. I thank you for the opportunity to explore the amazing and wonderful world of aviation. You didn't have to do this for us, but you care about aviation and inspiring young people to reach for their dreams. Thank you for what you have done for us, thank you for what you have done for our country, and God bless. Thank you so much for the experience to be able to go and ride in an airplane. This was the first time I have flown in a smaller airplane and it was one of the best experiences I have ever experienced. Not many people have the opportunity to go and fly in an airplane for free. 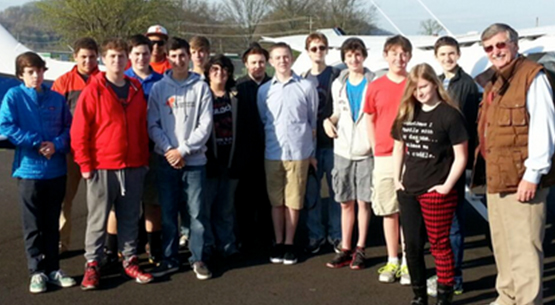 While we were flying I made my decision to continue to the journey in the aviation course at the high school. Again, thank you so much for spending your time in the foundation to give kids the opportunity to go ride in an airplane. I wanted to thank you for providing this flight. This was by far the best thing I have seen. The flight was brilliant and I would do it again anytime. There was no negative thing I experienced during the flight. This has made me way more excited about aviation. Seeing the cars and house from above was amazing. If you hadn't provided the money for this flight I probably wouldn't be able to do it. I really appreciate that you let us use your plane and resourses today. I learned a lot about how a small airplane fly's and functions this being my first time in one. After today I am even more inspired to get my pilot's license and become a pilot. Basically I would like to express my gratitude towards you and your generosity. Thank you so much for letting us fly around. Thank you for providing the planes for a first time experience. This has made me become so much more excited about aviation. Everybody was talking about the trip and everybody loved it. My pilot was cool, the airplane was cool, and the experience was cool! You have made me want to take aviation the next 2 years in high school. I had flown in an airplane before, but never in the front to where I could hear the transmissions. This has been my favorite field trip ever! Thank you for letting us come and fly. It was fun, and I've never flown before so it was a once in a lifetime opportunity. This made my classmates and I want to continue to learn about aviation. I've always wanted to fly and today gave me that opportunity and I thank you for that. I had a really good time and hope to do it again someday. I would like to say thank you for providing the resources so that we could take this flight. The flight was amazing. It was the first time I have ever flown in a plane before. It was a ton of fun. It was an experience that I will never forget. This flight has really increased my interest in aviation. When I heard about this trip I had been looking forward to it since the beginning of the year. This was a truly amazing trip and I would like to say thank you. I would like to thank you so much for allowing our class a free flight. It was a great experience to be able to fly in a smaller aircraft. I'm so glad I have had the privilege to be part of such a great program to be able to actually fly in the first year. I am really open to aviation as a career after today at the airport. Thank you again for this great opportunity, I hope you have a great holiday season. Thank you so much or providing the resources needed for us to fly today. You have introduced a whole new spectrum of career opportunities for me. This flight was so amazing - I had never previously been in an aircraft. You and your foundation offer lots for young kids looking for a career. Again, I thank you so very much for giving us the great opportunity to discover the field of aviation. I had a great experience. I've flown on commercial airlines before but it was nothing compared to this flight. I liked it the most when we did the zero gravity and all that. It felt like we weren't going fast but in all actuality we were. Thanks for the flight, it was awesome! I have never flown before, it was a great experience. My favorite part was the zero (g)'s. I loved flying! Thank you, it was amazing. I had a really fun time flying; at first I was really nervous, but I overcame it, then it got really fun. I got to see my house and my block. The whole world looked like it was a Lego place. I had so much fun I wish I could do it again! I've flown in jets and commercial airlines before, but this was completely different in comparison. It was amazing. Today was the first time I flew in a plane. It was scary at first, but when we started it was amazing. I had trouble keeping it in line but it was fun. I had a wonderful time in the airplane. My favorite part was when we did 0 g. I have been flying before, so it's what I thought it'd be like. But, it was very fun. I loved it! The view was amazing. It looks so different from up in the big blue sky! I don't think I'm much of an airplane guy; I'll stick to helicopters lol. Mr. Holm's did a good job flying, for the most part lol. We flew over GHS, Chuckey-Doak and Vo-Tech, it was ridiculous. The 0 gravity nose dive ruined my appetite, but it was cool. After going on my first flight, I have to say that the experience was enjoyable. The zero-g part was particularly funny. However, I would rather not go up again for a while. This plane ride was awesome. When we did zero-g's it was scary. I hated it when it was actually not so bad. I might try it again. The ride was fun; you could see all sorts of stuff while flying. The best part was dive-bombing the barn and tracks. I would fly (Not Pilot) it again. This was my second time flying with the colonel. It was a great experience and I hope to eventually fly in the Air Force. It is very interesting to see the places I see every day from a whole new angle. Finding the building can be difficult at first, but it's fun to figure out where you are and see what it looks like from above. I can't describe it. The only thing I can say is it was the most amazing thing I have ever experienced. All elements of the flight were equally good to me. This was my second time flying; it was better the second time around. I thought Alexis Jessee was going to KILL me. But, other than that, it was fun. The zero-g's were a lot of fun. It was better than 2-G's. This was my first plane ride and it was awesome, especially when we took off. The turns that we did were really fun! I was getting a little sick but I would go and do it again. Today was the first day I have ever flown a plane. The takeoff was the most intriguing part, considering Mr. Lundy was the co-pilot who was flying the plane. My favorite, as well as everyone else's experience, had to be the gravity change. This was my first time flying. It was a pretty good experience. The feeling you get when you dive is indescribable. Sitting in the back is cool, but you can't really see anything in front of you. I can't wait to go again! This was the second time I had flown, but the first time I was co-pilot. The best part was being in control of the plane. The zero-g was pretty fun, and I was not very impressed with my landing; it was not very good. I hope that flying a plane is not like driving a vehicle. This was my first time flying, and was the best feeling I've ever felt! I love the zero-g's. When we were weightless, the feeling cannot compare to anything. This is my first time flying in an aircraft; and it was fun for me. When I was in the aircraft I got to fly and it was really awesome. The zero g and 2 g were also really awesome. I really liked it. It was fun and I did get a little bit scared but not that bad. I wish I could do it again. I really had a fun time. I've wanted to fly ever since I was little. I love to fly, it is my dream to fly for a living. I really liked the 2G turns. I want to be able to experience up to 9G one day. At first I was scared that I was going to accidentally crash, but he helped me with not being scared to let go. When we went up I was shaking and then he was pointing out different schools and then he said "put your hands under your legs" and the he dropped. I was so scared I was going to die. And then he turned to the side. I looked back and laughed at Ms. Harlow's face. I'm still kind of scared but just a little. It was fun for my first time. Thank you for the excitement. This was my second time flying, first time getting to steer and play with the pedals. It was amazing. It was a great experience over all. It was a great experience. I had a good time, especially nose diving, that was cool. The only thing I didn't like was getting a headache afterwards, but overall, it was awesome!!! I had a lot of fun in the airplane, even though Mr. Lundy was flying. Seeing the bag fly up was the best part. Next time we fly, I really want to be co-pilot. I just hope that I do better than Lundy. I thought that the flying was awesome and I enjoyed it. I really liked the different turns. The view was awesome and I got to see my school from the air. I would like to do this again. I highly enjoyed flying this morning, I have been once before and my fear of flying has subsided. This experience is a once in a life time opportunity and I would glady do it again! I had an amazing time. I have not flown before and it was nothing like I've ever expericend. The zero gravity turns and the 2 G turns were amazing. Col. Powley is a great guy and I think its great what he does for JROTC. It was the second time I flew with you. It was awesome again. The zero g was always pretty cool. I wasn't really scared again. I wish I could do it again but this is my last year. My experience with Col. Powley is always one I will never forget. To have someone with his experience to work with kids is amazing. He is a great man who does great work. Flying is a great way to connect with kids as well. Every time we fly everyone wants to do it again because it is such a fun thing. I hope Col. Powley keeps doing this and continues being a great man. It was fun, went up past Wal-Mart. I saw my home - that was cool. The bombing was fun as well as the zero g turns! It was really exciting. My favorite part was the zero G's. It felt so akward. But, I really enjoyed it though. I had a great time. I would definetly do it again! This was my first time flying and I felt like I did a good job. I want to get my pilots license just to fly. If we can come back I will want to pilot it again. Thank you for the flight! I loved it. It was the best thing I've ever done! I would like to try it again. It made me a little sick but what an experience. My first flight in a plane was absolutely mezmorizing. I may not have been piloting, but I loved the feeling of being in the air and feeling of being light. Being in that plane was nice and I can't wait to do it again! I loved flying for the first time. I didn't like controlling it because it was scary. But, I'm a big boy so I didn't scream. Big boys don't cry. I liked it very much! What I liked about it was the flying at zero gravity. It was fun. Zero G was fun. Felt weird though. But, otherwise, it was fun. I would like to do it again. But, I wouldn't want to pilot. I enjoyed the flying, especially the 0 G. Although, it's not my first time. 0 g's always gets me. I loved the part when we dive bombed the barn. This was a new experience for me even though I have ridden in a large plane before. I would have to say that my favorite thing was zero gravity. My least favorite thing was landing because I didn't want to stop flying. This was my first time flying. It reminded me of the Wild Eagle ride at Dollywood. It was amazing and please take me again! This was my first time flying ever. At the start, I really thought I'd barf or something. As we got into the air, I was instantly calm. Overall, I'd say that this was one of the most interesting things I've done in my life. The best part? The entire thing. This was my first flight and for the most part it was enjoyable, despite my fear of flying. I don't think I will do it again, but it was a nice thing to experience. This was not my first flight, but it never gets old. My favorite part was when we pulled zero and 2 g's. To be honest, I didn't have a least favorite part, it was all great! I have never flown before, so it was a very cool experience. I loved all of it. Today was my second flight and I enjoyed it better than the first. The zero G was actually fun, but the 2G was the best! This was not the first time I was in a plane. It was fun steering and landing. I liked zero G most, but I don't like 2 G.
This was my first flight. I got some great video. I wasn't scared at all. Not the first time I've been in a plane. It was relaxing until zero G. My only thoughts were, "oh my God". Despite that, it was exciting. Today was a great day! It was the best view I've had all day. It was my second time in a plane. The zero G's were amazing and scared me to death. The 2 G's felt weird on my face but still amazing. Thanks for an amazing flight. This was my 2nd flight ever. It was a nice experience, and I loved every part of it. Zero gravity was amazing! It was my first flight in a plane. It was scary at first but after we got off the ground I loved it. When we did zero gravity it was amazing. Thank you and I'd do it again. This was the first time I have ever been in an airplane. I got to fly and it was the most amazing thing I have ever done. There weren't any parts I disliked, and I can't wait to fly again. This was the first time I've been in an airplane. It was awesome going to zero G's. It was more fun than anything I've ever done. It was my first flight. I didn't even realize we left the ground until I looked out the window. I never felt scared at all. It just feels like I was in a car until we did dives and went up. There was nothing I didn't like about it. I loved the 2 G's and zero G's. It was really awesome. I liked how we were sideways going forward, that was really cool. I wasn't scared at all. It was a casual ride. The zero gravity thing was nice because I love roller coasters but this one had no tracks so that's a plus. There was nothing I didn't like about the ride. I hope I can do it again. Thank you! It was my first time flying and I was really scared but then it got better. My favorite part was the zero G's and my least favorite part was the 2 G's. It was a lot of pressure for me being the pilot. Today's fly day was really fun. I have flown before and also one other time. I enjoyed all the maneuvers Col Powley performed. Today was my first time flying a plane. It was cool. I liked the zero G part the best. The hard part is keeping the plane in line. This was my second time flying. I was a little scared when we did zero G and 2 G but I trusted that we wouldn't crash. I had a great flight! This was my first time and I would do it again anytime! It was really fun and relaxing. He is a great pilot. I had a great time! It was my second time flying so it wasn't scary. I absolutely love 0 G's. This was my second time flying. I really enjoy the whole thing. I thought I would get sick on 0 G's but didn't. Please take me again. Hello, I'm Tristen Mintz. I go to Innovation Academy. That was my first flight and it was so much fun. The 0 g and 2 g were my favorite part of the ride. When you went side to side, that was not my favorite but not my least favorite part. My least favorite part is when we went up because that was my first time and I was scared to death/nervous. It was so much fun. Thank you Col. Bill Powley. You helped me get over my fears of being up high and in the air. My name is Claudia McDavid. I'm in 7th grade at Innovation Academy. This is my first time flying. I was nervous at first, but then I settled in. I got to see lots of amazing sights such as Eastman and Sullivan South High School. The plane ride was very fun. I enjoyed 0 G.
Today my friends and I took an exiting trip up in a plane. I sat in the back with my freind Caleb who helped me video the experience. My friend Matthew got to sit up front with the pilot. Because this was his first time you could tell he was quite scared of flying. When we first took off you could hear a loud rumble and feel the plane shaking, but as we taxied it all started to go away. We flew around for a few minutes and saw all the local high schools. We also saw Eastman Chemical Company and Warriors Path State Park. When we where done on this already entertaining tour, our pilot started to kick up the heat. He first started by doing a zeroÃÂÃÂÃÂÃÂÃÂÃÂÃÂÃÂ­g maneuver. This means that he caused the plain to go weightless in the air. If was quite fun but scary at the same time. Caleb and I felt like we where going to pass out, but soon regained awareness when he stopped. Next he did a 2 g turn. This means that he increased the weight of the plane and the occupants inside. This was more fun than scary, even thought he had the plane on its side up in the air. Overall I loved this field trip and would love to experience it next year. On the flying trip, we were on a four-seater plane. Col. Powley was our pilot. I flew with Cora and Lauren, Cora being the copilot, Lauren and I sitting in the back. When we got on we buckled up and put on the headgear. The takeoff was loud and words were said between Col. Powley and the base. We also saw some of our schools. We saw Central, North, and South High Schools, Rock Springs Elem. and Dobbins Bennett High School. We saw Eastman and the tail end of Downtown Kingsport. We also saw Boone Lake, which is currently very very low. Then Col. pulled out the bags, and we didn't know what was happening. That's when we were at 0 gravity. At this point everything was floating. Then we went straight into the 2-G turns. This was quite a erratic change. That's when we tried to lift out feet and phones, which was quite difficult. My name is Aiden Ponder, I'm a seventh grader from Innovation Academy middle school. This wasn't my first time in a plane, and it actually wasn't my first time flying here either. I fly a lot to see family or on vacations, and I came here once before with my scout troop, #284. Last time however, we didn't get to do the "stunts" because the other two people in my plane were going for the first time, and didn't want to do it. It was fun last time, but this time was a lot more fun. My favorite part was the 2 g turn. When we finally were able to lift a bag, we played the fastest game of catch ever! You felt like your stomach dropped, and you weighed one thousand pounds. Before that though, we did the zero gravity drop. He started up, and then just dropped. The bag in our lap flew up in the air. When you go on a plane, you really wonder how they get in the air, and what forces act upon it. I later found that the forces acting upon a plane are: thrust, which is caused by the propeller, lift, which is caused by the shape of the wing, drag, which is like friction in the air, caused by resistance, and pull, or gravity. You were really able to see a lot. We saw just about everything in the area. We saw mine and Benjamin's houses, and Benjamin's grandparents house. Eastman looks enormous from up above. Although I've seen all of this before in a plane, it's better when the entire point of the ride is to look around. My name is Benjamin Kiser, I am a seventh grade student at the Innovation Academy. This was my first time in a plane so it was pretty exiting. The view from up in the air was amazing. It seemed like you could see for miles. The engine was pretty loud so we had to wear headsets to communicate with each other while in the air. When we did the two G turn, we tried to lift a bag into the air. I was able to lift the bag and my legs. We also did a zero G drop where everything was weightless. It was super incredible how we changed the amount of gravity in seconds. When we were in the air the plane was fighting gravity to stay in the air. The plane was using thrust to fight gravity. Drag is the air resistance against the plane. Lift is the shape of the wings making the plane lift off the ground. Over all I thought that flying with Col. Powley was an amazing experience. I am Katie Brady, I am a seventh grader at Innovation Academy. This was the first time I flew in a plane, In the plane I was with Abby ( the laugher), Tristen, and Col. Powley: who flew us. The first sight I saw when we took off was the building on the ground getting smaller and smaller. My emotions for this flight were excited, happy, nervous and scared. The only thing I could hear on this flight was the people on the radio and the propellers. There were many forces acting on the plane, including gravity, thrust, lift, and drag. Gravity was acting on the plane during all of the flight except for the 0G drop. The Propeller was acting as the thrust on the plane. The terbutaline on the plane was the force of lift because the wind is under the plane and I lifts the plane up. The drag on the plane was pushing the plane back. The reason why the plane goes forward is because the trust has more power than the drag. I feel like this field trip was one of a kind I feel that we should do this every year. 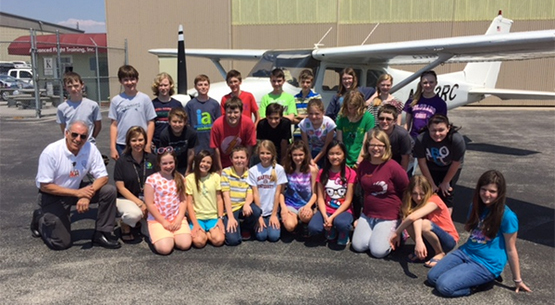 Today we visited the Tri-Cities airport for an airplane ride with Colonel Powley. We got to learn how to fly using the petals and the steering wheel. He took 3 people up at a time. While we took off we heard the air traffic controller talking to us into the mic. We got to feel what 0 and 2 g's were like. That was cool. We got to experience certain maneuvers for being shot at in the plane. When we landed we saw black hawks. The army was kind enough to let us see inside of them. 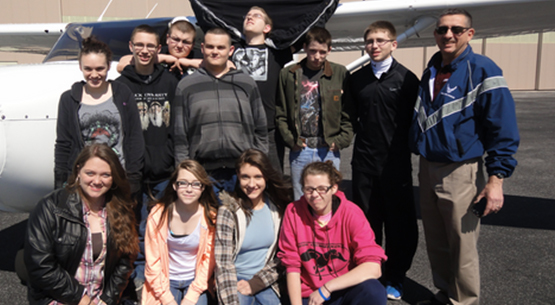 Today, my classmates and I took flight in an exciting experience through the air. It started with a lot of people feeling nervous and scared, but as soon as they were up in the air all of their fears went away. I was in a group with Matthew and Alex. As soon as we got in the plane, I was ready and excited. Matthew got to sit in the front while Alex and I sat in the back. This was my first time ever flying in a plane, so I was really nervous. The view from up in the sky was absolutely amazing. We went around Sullivan county, for the most part. 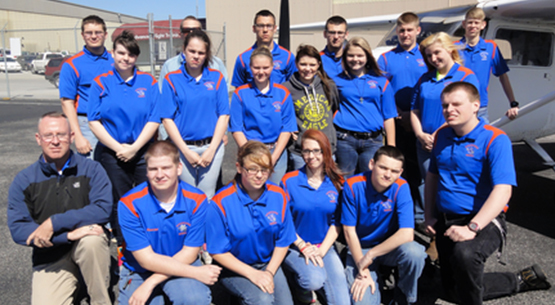 We saw several different schools, and a lot of interesting places like Eastman Chemical Company. I really enjoyed the zero g's drop, and I also enjoyed the 2g turns. But after that my head really hurt. As soon as I got out of the plane I fell to the ground and kissed it. We got to record the entire ride, so every time we saw something extraordinary we got it on video. I really enjoyed the ride and would love to do it again. Today we flew in a plane, I even got to co-pilot the plane. As we were flying you could see many different terrains. There were so many terrains that we saw some were mountains, forests, and others were more developed. We also saw some breathe taking sights of mountains and rolling hills. We were able to see many places from a whole new perspective. These included the schools we would be going to in the years to come, Warrior's Path State Park, and Boone Lake and marina. The best part about my adventure was when we experienced zero gravity and a bag flew into my lap. In the airplane weight is caused by gravity. The reason that the wings are important is because of lift. Lift is what keeps the plane in the air. Drag is when you go against the wind it slows you down like friction on a highway. Thrust is how you move forward or backwards. This has been one of the most exiting days of my life. 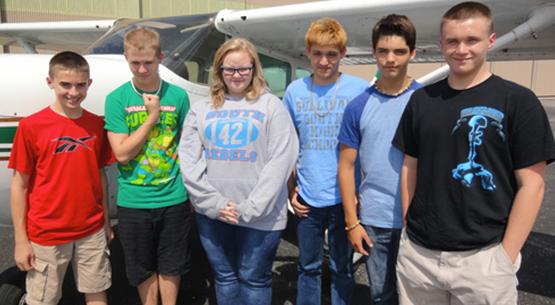 Today my classmates and I took a field trip to the Tricities Airport and learned about airplanes. Lt. Colonel Powley first discussed what the plane ride would be like. Then he took three of my classmates up at a time and flew them around a few minutes. They got to see the terrain and the pilot did a couple of tricks. For example he did a 0G drop which makes you feel weightless. We also learned about the parts of the plane. The front part of the plane consists of the wing, propeller, fuselage, and engine. The middle part consists of landing gear, 2x ailerons, and 2x flaps. The back of the plane consists of the rudder, 2x elevators, horizontal stabilizer, and vertical stabilizer. The wing helps stabilize and makes the plane takeoff and fly. The propeller makes the plane move and takeoff. The fuselage is the main body of an aircraft. The landing gear helps the plane move across the runway and land the plane. Ailerons are a hinged surface in the trailing edge of an airplane wing, used to control lateral balance. The rudder also helps steer the plane so it can make a full turn. The elevators make the plane elevate or descend. The horizontal and vertical stabilizers basically stabilize the plane. I learned so much today and had fun too! Today was the day that we flew on a plane at the airport. It wasn't a usual plane, one that you would use to go across seas, or long distances. It was a small plane, it could carry 4 people at a time. This was my first time being in a plane. To tell you the truth, I wasn't sure what to expect. When you started to fly upwards, you could feel the plane speeding up and fly off the ground, it was really amazing. When you're in the air, it's so beautiful to see everything around you so tiny. At one point, we traveled upwards directly, and it caused us to "lose our weight". The bags in the plane started floating, it was super cool. As for when we spun around, it was the exact opposite. Everything had 2Gs of force on it, making it much heavier than before. You could barely move your legs. I thought it was really amazing! I wouldn't mind going on a plane again, large or small. I had a good time and it was fun to do again. I would have to say that it was not smart to drink before going on the flying trip. I would like to become a pilot, but next time I am not going to drink something before I go flying. I had a blast. It was really hard to drive with the pedals and press the brake. And it is prettier in the air than it is on the ground. The wind makes flying a lot harder to fly than anything else. And now I have driven all transportation, sea, air and land. I absolutely loved flying with the Colonel. I have dreamed of flying a plane ever since I was little, when I used to make my dad stop at the airport so I could stand on the flight deck and watch the planes take off. If it was my choice, I would fly all day. I loved the zero-G too. I could feel all the blood rushing to my head! This is the first time I have flown in a small plane. I really enjoyed the flying. It was very fun when we were doing the O Gs. I enjoyed the flight very much. That was the first time I have flown in a plane. It was awesome! O Gs was the best part. I wasn't sure about flying later on when I join the Air Force. I have changed my mind about that now and definitely want to learn to fly. This was the first time I have ever flown. It was such a great experience and I loved it. I would love to do it again. I really liked it when my phone was floating in front of my face. This really makes me want to be involved in the Air Force.. This was the coolest and best experience I've had. I would like to fly more in the future, because I want to be in the Air Force. The OGs was the coolest part of the flight, besides the 2Gs. I wish I could fly every day, even if it's only for a few minutes. This was the coolest thing I've ever done. I want to take flying lessons if I ever get the chance. This is the best experience I have ever had. I can't believe that I actually got to fly. It makes me want to take your solo flying class. I was never much for roller coasters, but you might have just changed my mind. Don't ever stop flying, Colonel, you are the best. Well, the flight field trip was a blast. I probably won't get that opportunity again in my life so I'm really grateful for it. Flying was nothing like I expected. It was a lot more like riding about in the air or something. It was a great time. I got to get out of school and fly over it. It was the best field trip I have ever had. This was so awesome. I loved every minute. Thank you so much for letting my son Jordan fly. He loved it. Hey, also remember I am the only one to get stuck getting into the plane. Thanks so much for what you are doing for the young people. This was my first trip on an airplane. I was kind of nervous getting on the plane. The plane was called a Cessna. It was bumpy. Then we took off after we got into the air. It felt a lot better until we hit zero-g. It felt like we did a loop and your stomach flew out of your body. We went over my school and the mall. You can see everything when you're that high up. Flying was so fun. I will never forget this experience. It was a great flight. We would want to do it again. It was the best flight ever. I would just like to say this was the best flight ever and I'd like to do it again. You are a great instructor. I would like to thank you for taking the time to fly the R.O.T.C. I would like to do this again. It was a fun flight. My experience riding in a Cessna 172 was wonderful. At first I was shaky. Once we took off I was fine. My favorite part of the plane ride was being a thousand feet in the air. I could feel my bologna sandwich go up my throat, and my lips we rippling in the wind. Thanks Colonel for taking me up. I loved today's flight. I am not big on the g-forces. It threw me. However it was one of my best plane rides I have ever had. I would definitely do it again! For my first flight experience, I had an amazing time with Cadet Estep and Col Powley. It was an amazing and life changing experience, especially since I got the exciting chance to fly. Zero-gravity and 2-g's was a very new experience. I hope I get to partake in this experience again. Thank you for allowing me to experience this. Today I had the best day of my life at R.O.T.C. We got to fly. It was my first time flying. We saw Duck Island. We hit zero g's he went straight up then down. The R.O.T.C was happy today. I also think R.O.T.C is important because it teaches discipline and respect. I loved the trip. It was a little scary at first. We also saw Eastman throughout the day. The plane has come over my house. We saw a lot of pretty things. All in all, the trip was fun and I would like to do that again. The plane was fun. It shows that you can do anything you want if you put your mind to it. Yesterday I went flying with Col. Powley. Thank you for taking me. It was amazing. The view was beautiful. I can tell that you are a very experienced pilot. Thank you very much for taking me. Thank you Colonel Powley for taking us flying. My favorite part was the 0-G's; I would love to go flying again. I would also love to earn my solo pilots license, and I'm thinking about getting a job as a commercial pilot after I get out of school. Thank you. I flew on 9 September 14 and it was fun and scary and funny. One thing I did like was the fact that it was like a trackless roller coaster. One thing I didn't know that I know now is that my Mom has never been in an airplane and I have. So all in all it was fun and a little scary. Thank you Colonel Powley. First off, I loved the ride and I hope to do it again. I thank you so much for letting me fly with you. I hope to fly with you and meet you again. I really liked flying in the plane. It was a little frightening at times, but it was fun. I would like to say thank you for flying us in the plane. I'm a nervous flier. I hate to say it but it is true. After a while I got the hang of it. Whenever we did the zero gravity that was very fun. Thanks for the flight. I had a lot of fun. In flight, I especially liked doing zero G's, and making us weigh 2x more. It wasn't my first time flying, but a bush plane went higher than a helicopter. Something I would have liked would be to fly the plane; however it was a great pleasure flying. Hello, I will tell you how much fun it is to fly. The car ride was fun but me and two other people went first. I loved it. The one thing I did not like was the 0 gravity thing. It was just weird. But I did like how we went straight up..
My first time flying will be unforgettable. I got to be the co-pilot of the air plane, which was awesome because I coordinated the air plane a little. When Colonel Powley went zero g's it was awesome. He also did a dive and he told me to lift a black bag, which was hard to do because it was twice its weight. My flying experience has changed my life and I think I might go solo one day. I enjoyed my flying experience with Colonel Powley. I hope everyone that flies with Colonel Powley enjoys it as much as I do. I really appreciate you bringing me on the flight. It was one of the best experiences I've ever had! Thank you for that it was really fun. My favorite part was when you flew straight up then back down. Thanks so much for the flight! Colonel Powley, thank you for the ride in the Cessna. It was scary for my first time. I might do it again. My flight with Colonel Powley was exciting, educational, and fun. 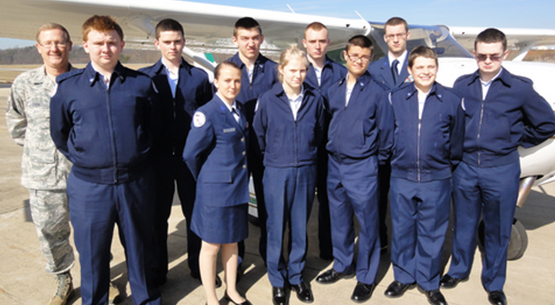 On my way to the Kingsport Airport the other cadets seemed so enthusiastic and energized by the flight; however I have always had a tremendously huge fear of heights and was so petrified I didn't know if I could do it. When we got there they told me I would not only be in the first group to go but also get to ride co-pilot. After getting our names and having a quick chat Colonel Powley told us to put our headsets on. He showed me how to lift the nose of our little Cessna 172 and let me help pull it into the sky. Colonel showed me how to steer then allowed me to for a little while. I didn't even think about my fear of heights. He showed me the school and surrounding areas such as Eastman. The view was truly beautiful. After doing a few air stunts Colonel show me how to land and we landed safe and sound. The flight was truly life changing for me. I am no longer afraid of heights and I send my gratitude to Colonel Powley, Master Sgt. Shawver, Colonel Williams, and the United States Armed Forces for making this important time in my life possible. Today I went flying, and it was an amazing time. It was awesome experiencing the two g's and the zero g's. It was an experience that I would love to do again. Flying yesterday was terrific! It looked like we were going to touch the clouds. It was amazing especially when I got to pilot for a little. When Colonel Powley started to do zero g's, it was kind of scary. That little black bag was so light, but then turned into what felt like bricks! I want to do it again before I leave for Crockett! We went in an airplane. Abby Bishop was the co-pilot of the plane. I had a lot of fun. I didn't like zero G's because it scared me. But the rest of the trip was fun. We went over the school and saw a bunch of things that were cool. We went flying Tuesday in a Cessna 172. It was one of the coolest things I've ever done. It made me want to get my piolet license. Thank you, it was a lot of fun. My experience flying for the first time was more fun than I thought it'd be. My favorite part of flying was the 0 g part where I felt weightless. It was fun because he went sideways and was acting like we were getting shot at. I would definitely fly with him again. My name is Cadet Cody McConnell and it was a privilege to go fly with Col. Powley. The adrenaline and the excitement to be the co-pilot was exhilarating. We all had lots of fun and look forward to going again, and I hope everyone treasures these memories as much as I do. It was a blast. I had a wonderful time. The best part was take off and landing. Thank you for taking the time to take us flying. I really like to fly with you because of the 2G, 0G, and the bomb dive. It's a great experience for a lot of people who have never flown before. I enjoyed having you as a teacher and would love it if you would come to school to talk more about the flying program for us to do our solo program. Not that many people know about it and would like to do it. Maybe one day I'll get to co-pilot and not sit in the back, but I always have fun no matter where I sit. Thank you so much for spending time to take us flying. I had a great time flying. I would do it again. My favorite part was 0 gravity. I thank you all who worked together for us to fly. This is my 3rd time flying with Colonel Powely and he makes the flight just so fun. When you fly with him he does some stunts that would scare you. He does a 0G, which is when you get so high that you get to zero gravity and nothing is holding you down besides the seat belts. He also does a dive bomb where he goes straight down and it is awesome. Colonel would just make it the best experience of your life. So, yesterday I flew with Col. Powley. And, even though I've done this before, it's still fun to do. Our group of three went second, and we had two people who had never flown before. We started, and I saw their eyes light up. They screamed when we did the 0G section. Overall, I will forever enjoy flying with you, Colonel. I feel as the trip was a major success overall. This trip itself expanded my interests in flying. I also enjoyed the pilot as well; he was very informative and taught many skills in the short time we were off the ground. 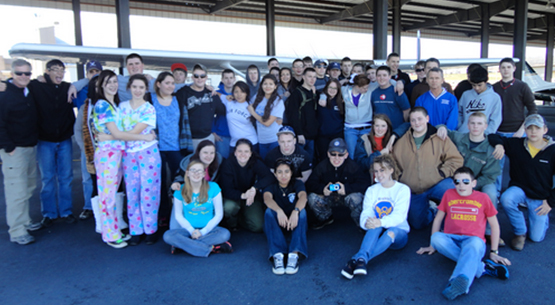 I feel as though the cadets that attended had a wonderful time and made the best of the time allotted. First, I want to talk about how excited I was going to go to the Tri-Cities Airport to ride in a plane. I honestly loved it and how it was organized. I had an awesome time. I would like to do it again but I'm the kind of girl that is very afraid of heights even though it's kind of weird and that I'm 18 years old. My mom will never get into a helicopter or plane because she is also scared of heights, so I guess it makes sense how I am afraid. Second is that how organized it was. We had 15 cadets that went and it was 3 cadets in a group and the pilot and Colonel Miles talked about how the wind kind of messes up the direction and it bounces and other minor things to the plane. I have learned a lot and very blessed that I have to do it with other cadets. At first I was scared because I have never have rode in a plane before today. What I liked about the Aviation Flight is it teaches the ones that never went before the experience of flying, and the ones that want to become a pilot a feeling of what instruments to use on an aircraft. I love to fly, I could fly ever day if I had a license and the time to go. And I love to fly with a retired pilot that was in the Air Force that flew jets. That gives me a lot of comfort that he can fly us in any condition whatever the weather is like or if the plane is going to crash. I know that he could save us and land it safely. I hope I can go for my last year in high school. I wish Terry would have gone instead of me but I hope she had as much fun as I did. I know everyone that went to the Aviation Flight today had a great time. What I really liked about the aviation flight was getting over my number one fear of heights. I also loved the fact of hanging out with a bunch of friends and having fun while we waited on other groups to get back from the flight. I might have been scared for my life when up in the air but it was fun, I will give it that. Today flying was just an amazing experience as it was last semester. If I could, I would go flying every day. I really enjoyed it and cannot wait to do it again. Thank you for the wonderful, delightful, and amazing experience. I love being able to have the experience of flying. I have flown before but I have a really strong interest in it and try to fly as often as I can. 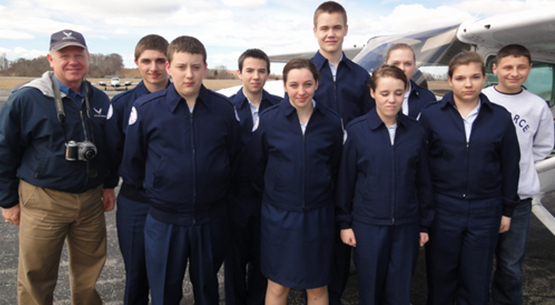 I believe this flying program that is being offered is a great experience for cadets and people to overcome their fears such as fear of heights and claustrophobia and even stepping out of their comfort zone. This experience gives cadets and people the opportunity to challenge themselves and raise their confidence that they can overcome things by facing them upfront. This program is a very beneficial and inspiring program and we thank you for giving us the opportunity. My experiences with the flight were amazing. I've never been up in a plane before the trip. And I can say I was calm, but still afraid of the plane crashing or something like that. I've flown in a helicopter before and it was a lot smoother. It was like riding a roller coaster but with better views. One thought I keep in my head was that more people die in car crashes than in plane crashes. Flying was fun. It gives you the feeling that the sky is the limit. When you are up there it is going to be extraordinary every time I go up there. You can get use to the feeling turning into a two G-turn or doing a zero G-turn. I like it even though I can't get used to having my stomach in my throat, but it gets your adrenaline going. Therefore, I leave this letter or summary of thank you for giving me or us any way you want to say it, but thanks it was fun. I believe flying was an excellent learning experience. Flying helped me decide what I would like to pursue as a career in life. Flying has also helped me make a decision on possible career paths in the military - which is I would like to join the marines as a pilot. Overall, I believe that flying was an excellent experience especially for those who have not been flying before. I thought that the flight was amazing and was a great experience for everyone who went. This is a great chance for us to learn some good stuff about aviation and the airplane itself. I liked the part of the flight when we did zero G's and 2 G's. I also am interested in the scholarship that the pilot talked about. I hope to do this again and had a great time doing so. I like the fact that we were able to drive the plane. Off topic, I also liked playing cards in the lobby. The other part I enjoyed is the tricks we did in the air. The main thing over all I enjoyed the trip by itself. Thank you for your time. Flying was amazing. It was windy. I would encourage every student to go flying. It is a good experience. I am interested getting my pilot licenses. I wish we would had longer time. However, it was super fun. One thing I learned yesterday while flying is that its way harder than driving a car. I also learned that being afraid of heights and feeling nothing under you is very scary. 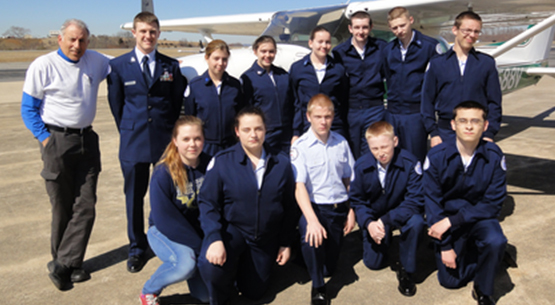 On 4/24/15, I and other cadets attended a flying trip. I got to experience things on this trip that, if not for being in JROTC, I would not have been able to do. 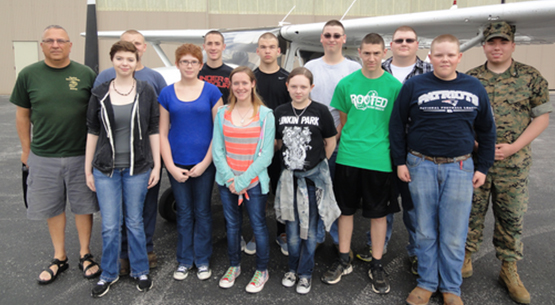 I had a great time flying with my fellow cadets. This trip only increased my interest in aviation, and I cannot wait to go back and do it again. I very much appreciate all of the people that made this wonderful experience possible for my fellow cadets and me. I love the zero gravity. Today was the first time I took pictures in the air/Zero gravity. It is so beautiful in the air. It was my first time flying in a plane. It was cool, and I'm looking forward to doing it again. It was my first time flying the plane and I did not kill no one. So I am happy and it was fun. It was my first time in a plane. I would do it again. It was a lot of fun. I couldn't be a pilot. Zero Gravity scared me like a horror story. I was a good pilot but not the best. So I don't see piloting in my future. This was my third time flying. This flying trip gets better every time I come. The zero gravity has to be the best of all. Fun, cool, had an amazing time. This was my very first time flying and it was really fun. Second time flying. Greater than first time. Third will be even better. Will go every time. This is my second time doing this, and I'm still not used to it. I had a lot of fun. I can't wait to do it again. This was my first time. I was really scared. But it was fun. Well its been so much fun every time. Flying for me is just such a great opportunity. It was a really great trip even though it was a little nerve racking it was still a great trip. I look forward to it next year as well. For a first flight experience, the turbulence was a little nerve racking, but otherwise a great first time experience.